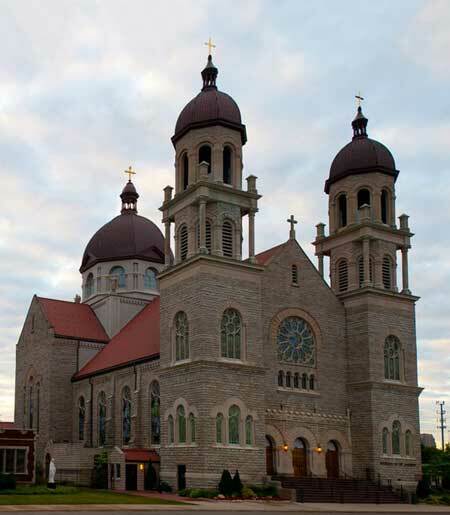 Basilica of St Adalbert is the first church to hold this rank in the State of Michigan, and one of the very few in the United States. St. Adalbert was raised to this honor on the occasion of the centennial of the parish in grand ceremonies on February 16, 1980. 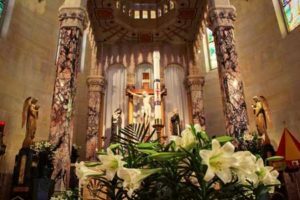 BASILICA comes from the Greek meaning “royal” or “regal” or “house fit for a king.” A basilica church is usually of Romanesque style, with the altar set before a rounded wall called the Apse. Over the altar is a raised Baldachino, or canopy, resting on four pillars. 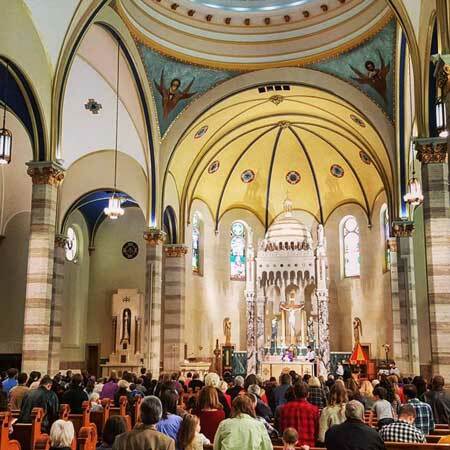 In order to obtain the honorific title of “Minor Basilica,” the parish church must have played a significant role in the furthering of the Faith of a particular area. The Saint Adalbert Aid Society was formed in 1872. At that time the purpose of the fraternal aid societies that sprang up in the primarily ethnic areas of the city, was to assist new immigrants in settling in the area, finding housing, and employment. With the help of the Saint Adalbert Aid Society, and on the initiative of the many Polish people of this area, two lots were purchased in 1880 at the corner of Fourth Street and Davis Avenue, NW, and in June of 1881 construction of a small wooden church was begun. Thus, St. Adalbert Parish was soon established. 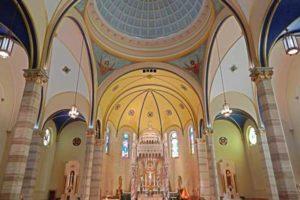 In 1891 the original church was enlarged to accommodate the ever growing Polish population. In 1892, the Society constructed a large meeting hall, pictured here, which remains in use by the Society and its members today. In early July of 1907, work began on the present church building. The cornerstone was laid on August 18, 1907, and the building was completed in late spring of 1913 for a total cost of about $150,000, including all of its furnishings. The original wood structure was moved on horse-drawn wagons to Belmont Michigan to become the parish church of Assumption of the Blessed Virgin Mary. The old St. Adalbert Church was used until the late 1980’s when a new church was constructed in Belmont. 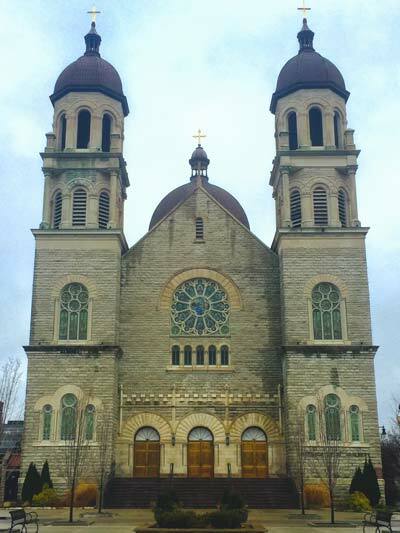 The Romanesque Revival edifice was designed by architect Henry J. Harks of Cleveland, Ohio. Architect Chris Vierheilig of Grand Rapids supervised its construction. 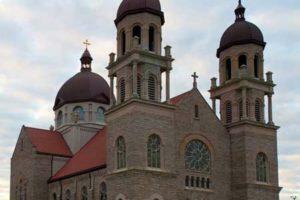 The exterior walls of the Basilica are covered in limestone from Sandusky, Ohio and it is trimmed in Bedford limestone. The two towers that flank the façade are 134 feet (41 m) high and the large central dome rises to 134 feet (41 m) above the ground. In 1867, just a year or so after the end of the Civil War, Father B.J. Wormers, pastor of St. Andrew’s, purchased three acres of land at the juncture of Bridge and Cadwell streets for the sum of $1,000. It was a swampy plot of land, and according to the older residents of the parish there were vociferous complaints about the “mud-hole” that had been bought for a church. When Father Wormers was succeeded on October 6, 1868, the new pastor, the Rev. James Claude Pulcher, immediately took an interest in the project of excavating for the new West-Side parish on Bridge Street. The 6th, 7th, and 8th wards of the city were erected into a new territorial parish. Since the parish was a predominantly Irish one, the first choice of a patron was St. Patrick. Father Pulcher is said to have favored Our Lady Star of the Sea, but strong sentiment favored honoring Father Pulcher himself in some way. His patron, St. James the Greater, the apostle and close relative of our Lord, was finally chosen. Work on the foundation of the present St. James Church was begun in 1869 by Thomas Berry. Sufficient stone was found on the land to build the foundation, and most of the work was donated by local farmers. Contractor for the brickwork was Patrick O’Neill. The firm of Smith and O’Grady contracted for the woodwork. The architect was William G. Robinson. In the spring of 1872, the Rev. James P. McManus was sent from Detroit to assist Father Pulcher at St. Andrew’s. Father Pulcher was given his choice of remaining at the older parish, or going to St. James as pastor. He chose “St. James and the poor people,” he said, and in June of 1872, he was made pastor of the newly erected West-Side parish. On July 21, 1872 the new church structure was completed at a cost of $38,000. Bishop Borgess performed the dedication ceremonies, and after the blessing, the first Mass in St. James followed. 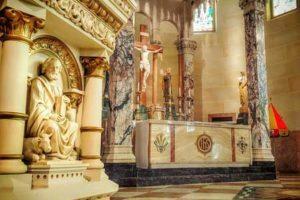 The church has been renovated over the years to meet contemporary liturgical requirements. The parish has worked to adapt to changes in its neighborhood. It has also focused on community outreach, founding the West Side, now City-Wide, Food Drive among other activities. As our mission statement says, The people of St. James Church, united in the Body of Christ, welcome all and serve in the broader community. 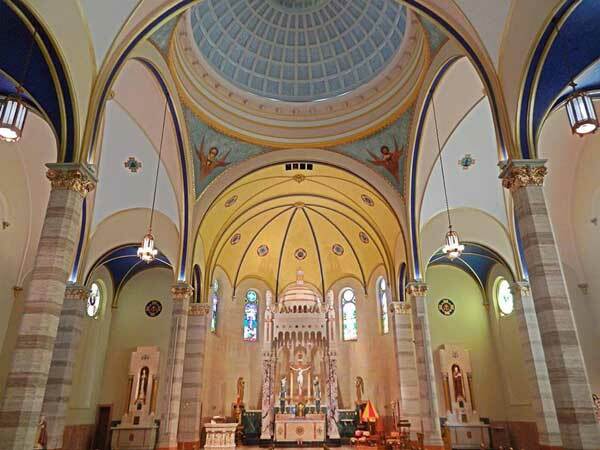 The Romanesque Revival edifice was designed by architect Henry J. Harks of Cleveland, Ohio. Architect Chris Vierheilig of Grand Rapids supervised its construction. 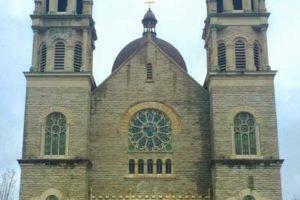 The exterior walls of the Basilica are covered in limestone from Sandusky, Ohio and it is trimmed in Bedford limestone. The two towers that flank the façade are 134 feet (41 m) high and the large central dome rises to 134 feet (41 m) above the ground. The dome reflects Byzantine influence while the facade’s large rose window reveals Gothic influence. 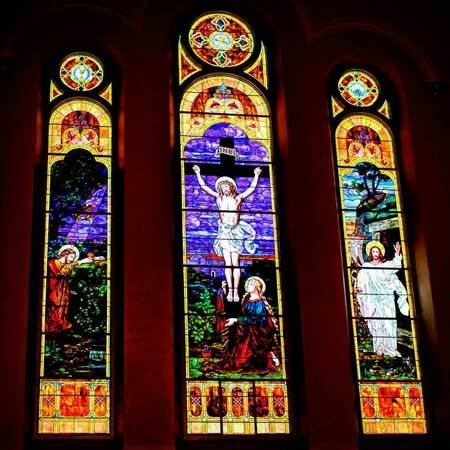 The Basilica’s stained glass windows were designed by A. Artmaier and created by craftsmen from Munich, Germany. Edmund Verlinden designed the altars, pulpit, baptismal font, and confessionals. 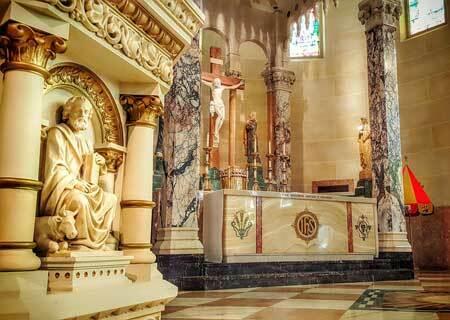 The original communion rail was topped with Georgia marble. With the help of the Saint Adalbert Aid Society, and on the initiative of the many Polish people of this area, two lots were purchased in 1880 at the corner of Fourth Street and Davis Avenue, NW, and in June of 1881 construction of a small wooden church was begun. Thus, St. Adalbert Parish was soon established. 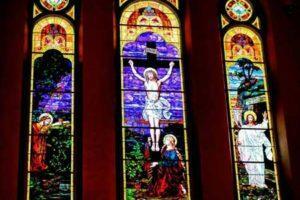 In 1891 the original church was enlarged to accommodate the ever growing Polish population. In 1892, the Society constructed a large meeting hall, pictured here, which remains in use by the Society and its members today. In early July of 1907, work began on the present church building. The cornerstone was laid on August 18, 1907, and the building was completed in late spring of 1913 for a total cost of about $150,000, including all of its furnishings. 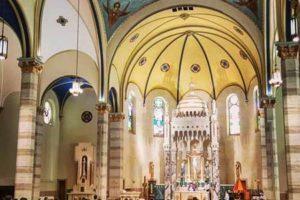 The original wood structure was moved on horse-drawn wagons to Belmont Michigan to become the parish church of Assumption of the Blessed Virgin Mary. The old St. Adalbert Church was used until the late 1980’s when a new church was constructed in Belmont.